Playing Planet of the Apes slots by NetEnt can be one of the best things to happen to you owing to many reasons. Judging from the fact that it is based on a popular movie that was originally produced in 1968, to term it as normal is an understatement. In as much as it became unpopular later on, producers have used the same concept to create successful films including the newest War for the Planet of the Apes released in 2017. Have you watched the film before? If you have, you will appreciate the film characters on the reels to create a nice gaming experience. Moreover, the movie’s soundtrack, the background voices of apes, and the fantastic visuals will leave you guessing what else is in store for you. 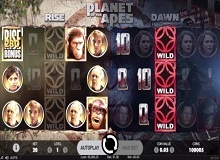 Planet of the Apes casino slot online will take the player on a roller-coaster thanks to two game windows, each signifying one of the films. While playing Planet of the Apes slot machine online be prepared to get numerous cash prizes. Who knows? You can also be a proud winner of a jackpot amount of up to 600,000 coins or three thousand times bet. For this to happen, understand the rules as illustrated on the gameplay and gather a few tips to help in maximizing your winnings. 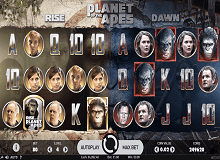 With Planet of the Apes free slot, you have the opportunity of using five reels, three rows, 20 fixed play lines to your advantage. Of course, you will come across wild substitutions, a stacked wild copy feature, a bonus round, and free spins feature. Now, stay tuned to find out how you can achieve all these. To start with, you need to adjust your coin values between 0.01 and 10. Once you are sure about your gambling decision, hit the “Spin” button to start playing. Alternatively, you can use the Autoplay option to get you up to 1,000 consecutive spins with a range of options when the spin comes to a halt. You can also access through your personal computer, mobile, tablet gadgets. For starters, the two reels operate independently hence they will crossover at some point. Whenever this happens, the dual feature will be activated. It will randomly select what you have chosen to spin. Instead of stopping the reels, the apes will mysteriously appear on your screen to ignite the Dual feature. There comes a time where the Rise and Dawn squares will take charge of separate random symbols, and both of them will be placed strategically on either side as the reels continue to spin. Only two of the icons will remain glued to the boards while any other appearing after that will be transferred to another location. If no symbol combinations appear, you will start earning your points. Cross your fingers at this time because you are about to reap big money. To qualify for the free spins, try to land at least three or more scatters anywhere on the reels. 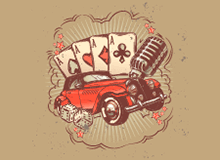 Nevertheless, each feature is different in the sense that the game’s free spins will be ten in number along with a special wild meter amassing any wild symbols which are gotten on the board. In this case, the maximum wilds you can collect are fifteen. After the ten spins have been used up, the wilds will be placed in different positions to buffer your scores. It’s that simple! To get the Rise bonus, you need to land a bonus icon on the first reel. The Dawn feature, on the other hand, requires you to land it on the last reel. The Rise Bonus feature comes as a result of every human and ape symbol placed on the board besides the scatters. To get the stacked wild feature, the Dawn reels will need the Rise to cause a double effect. Should the Rise reel become fully occupied by the Wilds, they will be doubled in the same position on the Dawn board. 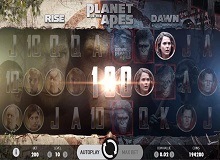 The software developer must be applauded for its magnificent efforts in creating the Planet of the Apes game slot that not only offers gamblers with an ultimate gaming experience, but it also has useful features that they can use to win great prizes. With an RTP of 96.33% along with cheats-free frameworks, gamers will be happy knowing they can maximize on their gambling skills to win big. Are you that ambitious gambler? Here is the chance to put your skills to test.